One of the most popular and fundamental tools required by almost every auto andtruck repair shop is the standardtransmission jack. 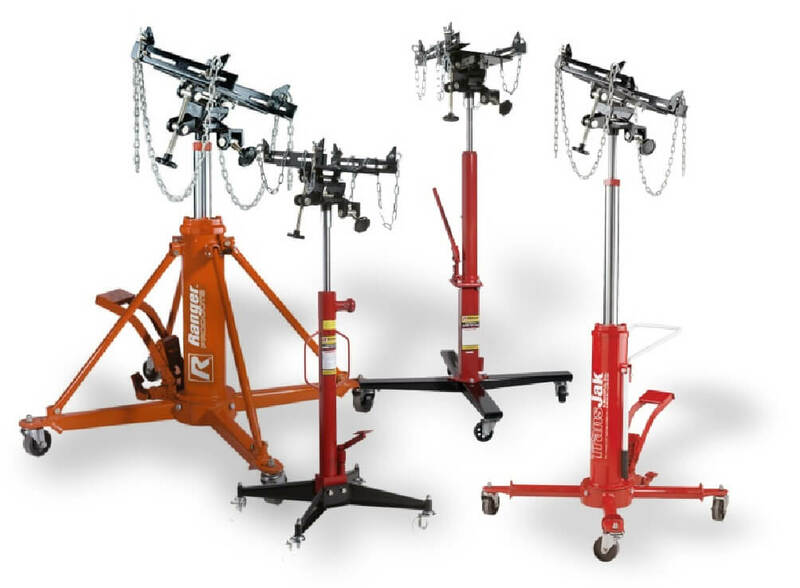 These powerful, multi-task lifting systems are versatile and essential for a wide range of different repair and servicing jobs. 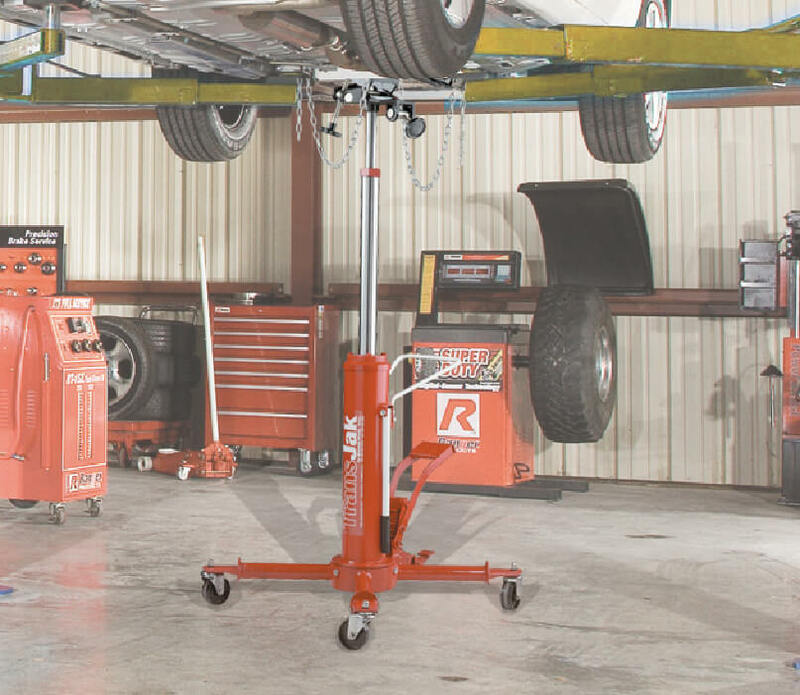 Unlike a conventional hydraulic floor jack or bumper jack which raises a vehicle using either the chassis, or the axles, a transmission jack is positioned centrally under the vehicle and lifts the transmission via a lifting platform attached to the transmission jack lift frame. If you've ever replaced a major component on a lifted automobile or truck, then you know how essential a reliable transmission jack can be. Ranger's outstanding selection of beefy transmission jacks is perfectly suited for holding and rolling just about any drive-train component in existence. Our transmission jacks have it all: heavy-duty chain anchors, overload safety systems, adjustable saddles, different pumping options, durable steel construction, alloy plated rams and holding capacities ranging from 660 lbs. to 3,000 lbs. RTJ-660 660 lbs. 51" 73" 30"
RTJ-1100 1,100 lbs. 45" 72" 24"
RTJ-1 2,000 lbs. 37" 79-1/2" 39"
RTJ-3000 3,000 lbs. 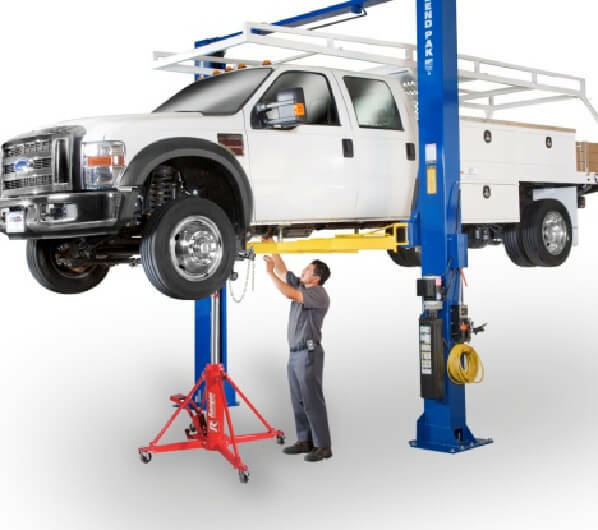 37" 79-1/2" 45"
Typically, when removing a transmission, differential, or gear box from a vehicle, it begins with the automobile or truck elevated on a two-postor four-post car lift or truck lift. The transmission jack is then positioned centrally beneath the vehicles transmission and raised slightly until the transmission jack lifting platform comes in contact with the flat surface of the transmission. After determining the transmission jack is centrally positioned and properly stable, it is then raised further to elevate the entire weight of the transmission so that it can be safely removed from the engine block. Once elevated, the hydraulic transmission jack can be raised further to allow adequate removal clearance. Prior to removal, it is important to secure the transmission to the lifting platform via straps or chains that are typically included with each transmission jack.